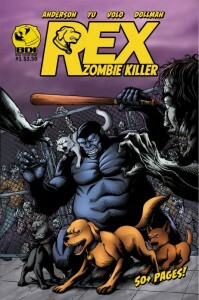 The first 26 pages of this novella and the next ten or so establish the slice-of-life daily routines of the cast of buddies: Ted the hyena, his foster brother Reggie (who prefers to be called Venti) the nine-foot-tall black jackal, Regis the zebra and his teen brother Lee, Kevin the tiger, and Art the lion. Most of them are gay, but that’s only incidental in this novella; it isn’t erotically heavy. The zombie plague doesn’t get serious until around page 40. 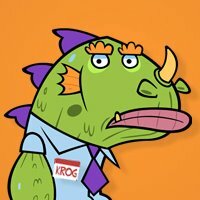 The main characters are Regis and Lee the zebras, Ted the hyena, and new characters that are introduced on the way. Some of the buddies make it. Some succumb to the zombie plague, or are eaten by the zombies. Some go to rescue their friends, without knowing if they are already too late. Dallas, TX, FurPlanet Productions, May 2013, trade paperback $9.95 (115 pages; on Amazon). This probably would have made more sense back around Halloween, but… Pick your own horror adventure: On four paws! 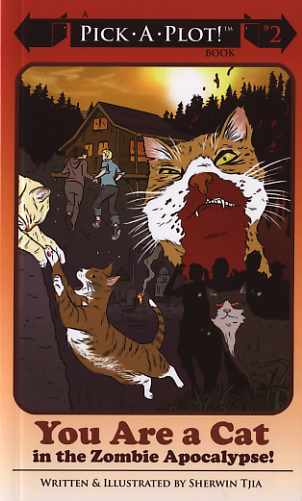 “Inspired by the gamebook fad of the 80′s, You Are a Cat in the Zombie Apocalypse! is the much-anticipated sequel to the first book in the Pick-a-Plot series, You Are a Cat! Lavishly illustrated from the first-person feline floor purrspective, the furightening and appawling You Are a Cat in the Zombie Apocalypse! is a horror tail that will stalk you, surround you and eat you alive.” This very strange black & white paperback graphic novel — where you choose on each page which horrible experience you have next — is available now on Amazon. It’s written and illustrated by Sherwin Tija, and published by Conundrum Press. 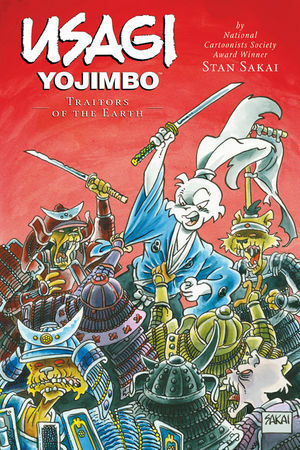 In the latest collection of Usagi Yojimbo comics coming from Dark Horse, the rabbit ronin faces an army of the undead! Here’s the publisher’s description of Usagi Yojimbo Volume 26: Traitors of the Earth — “With hundreds of zombies and an evil wizard to contend with, Usagi finds himself far out of his depth! Fortunately, he has the aid of fan-favorite character Sasuké the Demon Queller, most recently seen in the Yokai graphic novel. This volume also features several action-packed short stories, including the Eisner-nominated “Death of Lord Hikiji”! This volume collects Usagi Yojimbo #117–#123 and stories from Dark Horse Maverick 2001 and MySpace Dark Horse Presents #35.” When it arrives in stores it’ll be available in softcover, and also in a special signed hardcover edition that will be limited to 350 copies. The introduction is by well-known comic book great Walter Simonson (Thor, Orion). All of this brought to you by the multi-award-winning writer and artist Stan Sakai, of course. If you had asked me to name a comic book that would use the word 'ratiocination', I would not have picked Scooby-Doo. Nor would I have thought there would be so many zombies in one Previews. Surely this craze is past its sell-by date? No teenage zombie ninja turtles so far, though. And Radio Comix is back! But will they stay? Also Flight #7 and some new titles.